Induction cooktops are enjoying their time in the spotlight, and for good reason. Both chefs and manufacturers are endorsing this trendy new method, finding it to be a more efficient, more precise, safer and more flexible way to cook than conventional methods such as gas or electric. This flame-free cooking option works by generating an electric current when the unit is powered on and a compatible cooking vessel is present. Alternating magnetic fields affect the molecules in the cookware, heating only the cookware and what’s inside it, offering precise temperature control. One of the many benefits of cooking with induction is efficiency, both in terms of reducing hydro, gas and energy costs, and also reducing cooking times. “The units we use are more efficient [than gas],” says An. “All of the energy used is transferred into the food so the money spent on power is going directly into cooking.” Nunn explains that by doubling the power, some tasks — such as boiling water in large volumes — can be done in half the time. “In a restaurant, 10 or 20 minutes can be a painful amount of time,” he says. An agrees, stating he can boil two litres of water in a minute and a half. Safety is a big factor when it comes to cooking with induction. As the risk of fire and injury from flame drops significantly, the level of comfort increases. The equipment heats only the cookware and doesn’t give off heat to the surrounding area. Chiarot recognizes that induction greatly improves working conditions in what is normally a very hot and moist kitchen. “The air conditioner isn’t working as hard because now you have a much cooler environment,” she says, adding the ambient temperature of the kitchen and restaurant becomes easier to manage and more comfortable for guests and staff. Though the benefits make for a lengthy list, An says the major drawback is that people aren’t used to the technology, so there is a learning curve. “Traditionally, when cooking over a gas flame, the fire is still nearby and the chef can control the heat by lifting the pan up and away from the flame.” Meaning, cooking with induction often means rethinking the subtle routines of cooking with gas. He also says to beware the noise factor. “If your chef has to engage with a customer, you don’t want a unit with a fan that sounds like a vacuum cleaner. Barbecue — possibly humankind’s oldest method of cooking — is experiencing a re-awakening in commercial food operations. And it’s not going low-and-slow. Iconic barbecue, long the domain of high-profile pit-masters in the southern U.S., has been making its way into mainstream restaurants, says Steven Raichlen, James Beard-award winner and author of the best-selling series The Barbecue Bible. Barbecue is waking up to pit-barrel cookers, salt slabs, new fuel such as almond wood, “caveman” meats, pine and spruce finishing salts, more types of vegetables, rotisserie and “plancha-style” cooking surfaces. In a reversed order of things, trends in barbecuing and outdoor kitchens are originating from residential backyards and moving into commercial restaurants. Based in Concord, N.H., MagiKitch’n makes commercial-grade gas and charcoal barbecues as well as outdoor-cooking equipment for operators seeking portability and convertibility. “We saw a proliferation of [home cooks]creating these beautiful outdoor cooking spaces and we wanted to come up with a commercial version of that,” says Mark Lang, vice-president of Sales. Oakville which has been manufacturing serving counters for restaurants for the past 14 years, has seen a shift in interest toward outdoor barbecue kitchens — prompting begin making counters rugged enough to be used outdoors. “It’s turned out to be a big item for us in the last number of years,” Witt says, adding the company is about to launch a new website dedicated to professional outdoor kitchens. The food operations at a hotel, he says, might want a cooking area on the patio — where aesthetics are important — that’s tough but doesn’t look institutional. “It’s a mobile modular system that doesn’t look mobile and modular,” he says. Just as the boundaries of the barbecue belt are continuing to dissolve, Raichlen says there are signals that smoking is on the rise. “I called 2016 “the year of smoke” and that will continue into 2017.” However, he points out divergences: smoking traditionally uses pork shoulders, briskets and ribs, but it will now also take on vegetables, butter, heavy creams, Hollandaise sauce and desserts. In addition, Michelin-starred fine-dining restaurants are jumping on the smoking bandwagon in what Raichlen calls “Tweezer ’Q ” — using a smoker and a wood-burning grill to prepare refined foods such as pricey cuts of beef. Verity says smoking is convenient and efficient: smokers can operate up to 20 hours on one load of charcoal, making it perfect for low-and-slow 18-hour pulled pork. “Restaurants will buy a Primo [ceramic grill] and put it outside and they smoke all kinds of things on it,” he says. Tom Field, corporate chef at Concord, Ont.-based Alto-Shaam, agrees there has been an increased interest in barbecue and smoking from food operations. And while chefs have been using smokers for more than a decade, new equipment can be programmable, so staff don’t even have to touch the smoker box. “Restaurants are beginning to understand the value of putting the smoker option in their combi oven. They can get a smoker that cleans itself,” he adds. The myth is that the Waring blender was developed by Fred Waring, a musician who liked milkshakes so much he invented a machine for when he was on tour. At the time, the 1930s, blenders had small jars and low power and stayed that way until fairly recently. When it comes to jar size, blenders can have 32-oz. jars up to 64-oz. As for construction materials, while BPA-free polycarbonate is popular, glass is not practical and stainless steel is ultimately the best. However, at Waterloo’s Thrive Energy Lab, owner Jonnie Karan loves the 1,500 watts of power in his BlendTec. It has multiple programmable settings and several speeds for making approximately 100 smoothies a day on machines that have logged more than 50,000 runs, Karan estimates. The small restaurant and juice bar uses three blenders with a fourth utilized for other food prep. He says he considered three models, but prefers the plastic jug over glass. Juicers come in two basic types — higher speed, centrifugal juicers and slower “cold-press” masticating models. The primary difference is speed, with a low-speed juicer below 100 r.p.m. With a high-speed juicer, the juice product is typically good for about 30 minutes in order to ensure full nutritional value. Slow juicers prepare food that is fully nutritional for upwards of 72 hours. The proof is in the pulp: high-speed juicers release a wetter pulp, while masticating juicers result in a dry pulp. Kevin Keith, national project manager at Robot Coupe, has three tips for buying a juicer. First, make sure it’s a commercial-rated product and can work day-in and day-out; consider name recognition, which can be synonymous with quality; and consider whether you require continuous output of product. He says a benefit of the Robot Coupe J-80 Ultra and J-100 Ultra juicers is that they require no tools for assembly and disassembly. Long-used in the bar industry, nitrogen gas is now being infused with cafe drinks to give them a creamy and smooth texture. 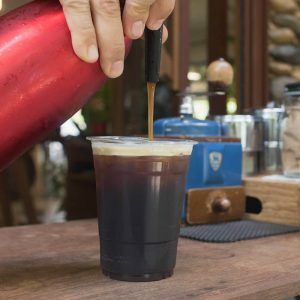 Nitro coffee is the most popular beverage that uses this equipment, but watch out for tea and kombucha tapped with nitro in 2018. Dishwasher air gaps confusing ?! A Break tank may be fitted to a commercial dishwasher to prevent any possible back flow of dirty water (containing food debris, contaminates, bacteria etc). from the machine into the fresh water mains supply. They are installed into machines to ensure that there is no chance of contaminating fresh water supply. b. from which water discharges at not more than 15° from the vertical centreline of the water stream. Follow the links below to get definitions of each of the recognised backflow prevention arrangements. This article aims to provide advice to businesses assessing their requirement for a Break Tank (Type A Air Gap) when purchasing a commercial dishwasher or glass washer, such as care homes, nurseries, day care centers and hospitals. The result is that contaminated dish water can never enter the fresh water inlet. Generally, businesses rated at category 5 or higher will include any high-risk areas such as Schools, Care Homes, Nurseries or Hospitals where contamination of the water supply would be detrimental to hygiene and health. It is the responsibility of a business to assess their own level of risk and comply with water board legislation. Any dishwasher that does not have a break tank fitted as standard can have an external break tank unit fitted later, although units are generally bulky and take up additional space. Not having a break tank will not affect the machines performance. It is possible your plumbing already has a device in the system at an earlier point which does the same job. WRAS Product Approval: Whole products such as valves, boilers & showers undergo mechanical and water quality testing. This type of approval demonstrates full compliance with requirements of the regulations and byelaws, provided the fitting is installed according to any conditions given with the approval. Whether you’re frying chips, fish, doughnuts or chicken, a commercial deep fat fryer is the ideal appliance to produce deliciously crispy and succulent foods. However, selecting the right fryer from such a vast range could seem overwhelming at first. For some businesses, a professional fryer is the primary cooking appliance, so it’s vital to understand the features and limitations of the machine before purchase. Power and Capacity: Whether you are expecting spikes in demand or a consistent, high turnover of food, careful consideration needs to be made to the power and oil capacity of the fryer. Higher power fryers generally heat up and recover temperature faster (sometimes called the response time), meaning more food can be cooked in a smaller time frame. Likewise, if you only use the fryer occasionally, a smaller light duty fryer could be more efficient in the long term. Although using a higher capacity fryer gives you the facility to cook more in one frying cycle, it also generally means a bigger fryer, which could use a considerable amount of valuable kitchen space. Power type: Commercial fryers typically use gas or electricity connections, with the most powerful versions requiring a direct, permanent hardwired connection to the mains to operate effectively. With the difference between the performance of gas and electricity versions being marginal, the decision would generally be down to user preference and the availability of a gas or electricity connection. 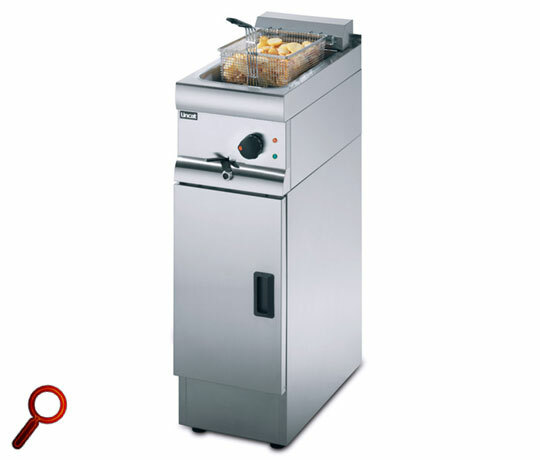 Single tank or twin tank: The majority of commercial fryers are available in single or twin tank configurations. This relates to how many separate oil compartments there are. The main benefit of twin tank fryers is the ability to independently fry two separate food types at different temperatures without the risk of cross-contamination. In addition, a twin tank fryer is sometimes considered more efficient as you can use only the tanks that you need. Conversely, a single tank fryer can accommodate larger or more frying baskets, allowing bulk frying during busy periods. Number of baskets: Multiple baskets allow you to cook more than one food type at a time, albeit with smaller quantities than large single baskets. Using a large single tank fryer gives you the option of using either single or multiple basket configurations depending on your menu options. Manual or Programmable: Commercial kitchens can be pretty hectic places, so some fryers have the option to notify you when the cooking is completed. Some of the very top end fryers even raise the fryer basket for you once the food is cooked. Although programmable fryers can cost more, they can save you a significant amount of time. Running costs: Without doubt, the most costly ongoing expense when operating a professional fryer is the cooking oil. Once oil is spent, the quality and taste of fried food can deteriorate – so oil should be changed on a regular basis. Therefore many modern fryers are designed to extend the life of its cooking oil by intelligent filtration or by implementing cool zones which prevent food sediment from burning and contaminating the oil. Due to the size and complexity of filtration systems, they are mainly seen within the stand on free standing fryers. Oil life can also be extended by manually removing food debris using a skimmer. Used oil can usually be recycled. some companies may even pay you to collect it. Note: Used oil can quickly block drains, so make sure to dispose of it responsibly. Which recommended Catering Water Boiler should I buy? Wall Mounted or Counter Top Counter top water boilers tend to cost a little less and are easier to install. (Most use a 13 amp plug and so you don’t need a qualified electrician to hard-wire them in.) Counter top water boilers generally have the option of a drip tray – handy for over spill and easy to empty. The down-side is they take up valuable counter space and are less flexible in use. Wall mounted water boilers are handy as they don’t take up valuable counter top work space. Easy to use if you need to fill large mugs or cafeterias etc as you can create a larger access under the tap. On the downside wall mounted water boilers are usually hard wired (by an electrician) and don’t usually have a drip tray to catch those over spills etc. How many people will the water boiler serve, at times of peak demand and on an hourly basis? If you work on 1 litre or 4 mugs, thinks about whether you have fixed breaks or not. For example, a school with 20 teaching staff all needing a cuppa at morning break would need a boiler with at least a 5 litre draw off. An office with a staff of 40 people but where the breaks are not fixed, could easily manage with a 3 litre boiler. Don’t forget meetings etc where there may be a high spot-demand. What are you filling? Cups and mugs or air pots and urns? All water boilers can fill cups and mugs, but if you are filling larger vessels, you will either need a taller counter top model or a wall mounted water boiler. Draw Off It is important to understand the actual draw off the water boiler is capable as this is the amount of water available for immediate use. Calculate how much water you will require during your busy periods when assessing the right water boiler for you. Heat up time Check heat up times from cold, as this may be important, different models and capacity take different times to initially heat up the water from cold before use. Water filters Filters are necessary to reduce lime scale build up any odours and ensure your customer experiences the right taste from their beverage. Free to all or restricted access? Can all staff / patients / visitors help themselves to hot water, or do you require a lockable push-button dispense; for example in care homes, shared-use venues etc? The griddle is a a popular piece of equipment for caterers, used to simply heat food on a metal plate, but any kitchen will find that it has many uses and desirable effects. In most cases, griddles are available as either gas or electric, but these days in some places steam powered griddles are offered on the market too. Flat griddles are by far the most popular due to the ease of cleaning. However, both ribbed and half ribbed griddles are available on the market. – The development of flavour that occurs with the browning (caramelising) process. – The tenderising of meats such as steaks and chicken breasts. – The development of crispness or a crust. – The drying out of products such as pancakes, bread and buns. – The melting off of fats, especially in food like sausages and bacon. • The kitchen requirements for the grill; this will help when considering the size to suit the needs. • Ask for advice when buying a griddle and tell a dealer what the needs will be; they are there to help. • Choose equipment which is easy to clean. • Griddle plates should have no gaps to allow grease to seep into the body. Look for fully welded plates or one-piece castings. Splash guards should be integrated for the same reason. • Larger units should offer the flexibility and energy saving capacity of a dual heat zone. • Major manufacturers offer a wide range of griddle plates including machined steel, ribbed, half-ribbed and chrome. Chrome griddles radiate less heat into the atmosphere and so are more energy efficient than steel plate models. This contributes to a more pleasant working environment. • Check the drainage channel – will it be easy to use and keep clean? A griddle can be a handy instrument to have in a commercial kitchen as it can be utilised in many ways. Other than the fact that griddles come in different shapes and sizes, there is another key decision to make when buying them; what type of metal will be used for the plate and what the finish of the surface will be. As with contact grills, griddles are available in cast iron, but rather than aluminum, are usually available in different types of steel as the alternative. Once a decision has been made about the metal for your griddle, the thickness of the plates has to be considered, as both have varying successes. Thin plates are more responsive when adjusting temperature, come up to temperature quicker requiring less energy and are generally cheaper. But they can warp if preheated at high temperatures and distribute heat less evenly causing hot and cold spots. Thick plates are less likely to warp, retain heater longer and distribute heat more evenly. But they respond slower to changes in temperature control and they require more energy to bring up to the desired temperature. Lincat recently introduced a new generation of advanced Opus SelfCooking Combi Ovens. The range includes a new compact model, the Opus SelfCooking Center® XS, which delivers all the power, intelligence and efficiency of its full sized counterparts, from a minimum of floor space. With a footprint of just 550mm x 655mm, the Lincat Opus SelfCooking Center® XS is a 6 x GN2/3 unit, which incorporates all the features and functionality of the larger GN1/1 and GN2/1 models. Perfect for even the smallest kitchen, it can be sited on a counter top or optional wall brackets or floor stands. When combined with a matching UltraVent fume and condensation hood, the XS can be built into any installation, making it great for front of house applications. Lincat have launched a collection of no fewer than 12 oven ranges as part of its new Opus 800 series of prime cooking equipment. Constructed on strong steel chassis, with heavy duty components, Opus 800 oven ranges are built to withstand the rigours of the busiest commercial kitchen. There’s a wide range of options to choose from including: gas, electric or dual fuel; burners, plates or solid tops; side opening or drop down doors. Each new oven range combines a stylish, streamlined look with reliable UK engineering to deliver enhanced performance, output, energy efficiency and serviceability. 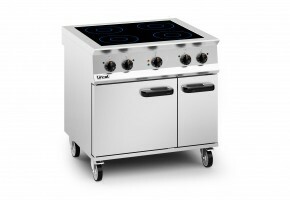 And, for the first time, Lincat has introduced a powerful induction top range to the series. The new induction hob top has 5kW induction zones, providing 270mm diameter induction cooking areas. Automatic pan detection function cuts power when no pan is present, preventing harm to users, while saving energy, and 6mm thick high impact resistant glass ceramic surface will withstand hard knocks and is easy to clean. Opus 800 hob tops are available in gas or electric, and can be supplied as standalone boiling tops. With single heavy-duty cast iron pan supports, the gas models are equipped with powerful 7.5kW open burners with dual concentric rings, to provide focused heat distribution from a low simmer to a high heat, whatever the pan size. Electric models feature fully pressed and sealed hob tops to facilitate cleaning, and heavy-duty, square or round cast iron 2.6kW hotplates to deliver fast responsive heat. The new Opus 800 oven ranges are equipped with large, powerful ovens, ranging from 6kW to 9.5kW, with the capacity to hold up to 6 x GN1/1. All are fan assisted, giving uniform heat and consistent cooking results, and each has a removable oven base for easy cleaning. Double insulated doors, side and back panels also allow for safe operation, efficiency and economy. Although deeper (at 800mm) than the Opus 700 range it replaces, minimal extra space is required for Opus 800 equipment, as it sits flush to the wall with a recess for connection to gas and electricity supply. Products are also quick and easy to service, as there is no need to pull out of the line for maintenance, meaning disruption is kept to a minimum. Individual items of equipment provide service access through the front or top wherever possible. Castors are fitted as standard, so pulling units out for deeper cleaning is effortless.